This Itoya Art Profolio® Photo Album has the same archival safe polypropylene construction that has made the Art Profolio the book of choice for professional artists and photographers. Album is specially designed for storing up to 120 4x6 sized prints or postcards. Each page holds three images and is perfect for standard photo paper and digital photo paper. 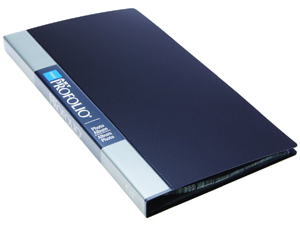 Profolio also features an exclusive black opaque polypropylene dust cover to help keep sunlight as well as airborne contaminants away from your precious images. A reversible spine insert allows for personalization and an enclosed storage pocket on the inside cover is ideal for storing CD's and memory cards.